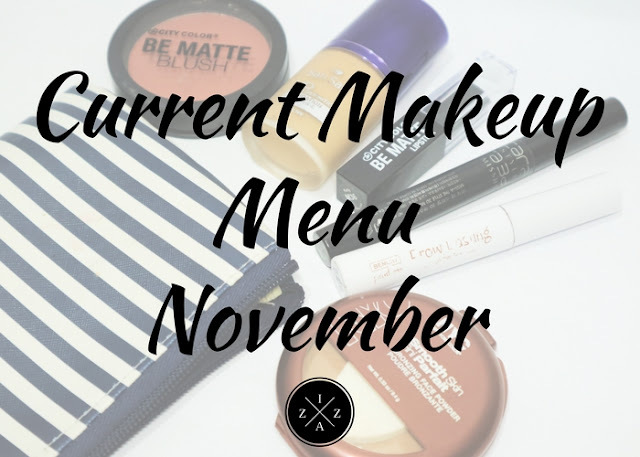 Long time no current makeup menu post and I'm glad I finally did it for November. If you follow me on Instagram you may have seen the picture I posted already. Surprisingly all in my current makeup menu are new products that I've accumulated over the past months. I hope you do enjoy this quick post. READ: Current Makeup Menu May and Current Makeup Menu July. For my Brow Routine, I finally got a new brow product of choice aside from items I use in My Current Brow Routine blog post. Bench PaintBox Lasting Brow Mascara is the bomb! I love how this amazing product is all I need to tame my brows. This is also waterproof by the way and what I used when I went to Caramoan. Yes!!! All photos in my recent trip where my brows are done and glammed is because of this bad boy. For Foundation, I am using HBC SanSan HD in Olive. It's the only foundation in my collection that gives me medium to full coverage. I've been breaking out on my forehead and nose area and this foundation help a lot to conceal unwanted bumps. I don't use this at work but rather whenever I have hosting. How I Use This Foundation? I love applying this HD Foundation using a paddle brush I bought at Angel Pretty Shoppe inside Pop Culture Trinoma. It makes the application super easy and the product blends nicely too. READ: HBC SanSan HD Duo Powder Foundation and Concealer. For Blush, I am sooooo happy that I invested in a matte blush. City Colors Be Matte Blush in Sunset Safari is so reliable. The pigmentation is on point and the way it looks on the cheekbones is legit. I love using this every time I do my makeup for event hosting. You can read my full review HERE. I still use my Ever Bilena Lip and Cheek Tint for everyday instant rosy cheeks. For Powder, I forgot to include in the picture but I do enjoy using my Avon Ideal Oil Control Flawless Pressed Powder in Shade Medium. This product and the SanSan HD Foundation is pak na pak combo. This will mattify your face and will keep you all set for good 2-3 hours. I also love using this powder foundation for retouching my makeup. For Mascara, I use the Missha 4D HD Mascara which I got from Charis. This is my second tube and it continues to be part of my favorite items. This mascara makes my lashes long in a natural way plus it stays well even though the weather is very humid. READ: All About Charis + Unboxing. For Lips, I also have a new addition to my Matte Lipstick Collection and it's City Colors Be Matte Lipstick in Kelly. This shade is super nice and perfect for a pop of color on the lips. I have yet to do a full review post on this product. Full Review here. That's it for my current makeup menu for November. Will do an updated one in the coming weeks or month. Hope this post helped you.